The scholarly communications team at Columbia advises the campus community on tools, initiatives, policies, and services pertaining to the research lifecycle, from accessing scholarship to creating, publishing, sharing, evaluating, and preserving it. Part of the digital scholarship unit at the university, we offer training and consultations on publishing, open and public access, measuring research impact, and scholarly identity. We also run the institutional repository and an established digital publishing program. Sign up for our 5-Day E-mail Impact Challenge and its kick-off event, the Elevator Pitch Workshop. Have questions about scholarly publishing, research impact and metrics, open access, research data, creating digital publishing projects, or crafting a professional presence online? 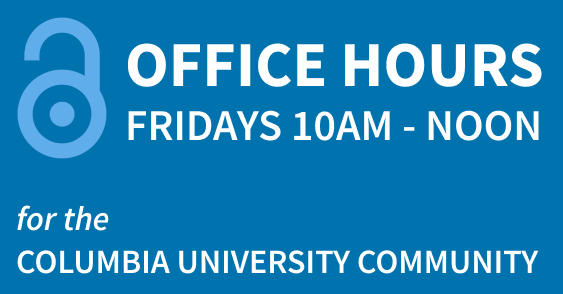 Drop into our open office hours in Butler 208a (Fridays 10am–noon) or e-mail scholarlycommunication@library.columbia.edu.